Don’t read this unless you enjoy adolescent burblings. First, the good news: I have an appointment with a GI specialist at the Western General, the hospital nearest to Servants’ Quarters. The bad news is that it’s not until 30 May, almost three weeks hence. I can cope with that, so long as the ever-wonderful Elly can put up with me, but I fear the delays between the consultation, treatment and eventual resolution of my conditions. Hanging on in quiet desperation is not the Brucish way. I’m even tempted by private medicine. I guess my route down that primrose path would be to have the NHS consultation, then go private for treatments that the NHS can’t provide in time or at all. I’m still very unsure of this. What right does anyone have to faster and/or better medicine just because he or she has money? Am I contributing enough to society that I ‘deserve’ better? Am I so necessary that my wellbeing has higher priority? I don’t think so. Meanwhile, I’m still very limited. Yesterday I walked to a nearby cashpoint so I could shop at the convenience store next to our flat. That was just about achievable. Standing and lying prone are still the only comfortable positions, while walking is a challenge because I dare not tread heavily and hence jiggle my innards. Sitting up yesterday to read out a list of books was eventually unbearable: pain and shortness of breath drove me back to my nest after about 30 minutes. Also, apparently I have most of the signs of depression. I didn’t recognise this because it’s not like a period of mental illness/depression 20 years ago. I’m not constantly thinking ‘there’s no point’ or considering jumping under a bus. I’m simply sad because I don’t know when or if I’ll be able to be me again: to be impetuous, energetic, amusing; to contribute in any real way; to cycle 60 miles and enjoy a beer in a new place. I’m able to converse in English, rather than stammer in broken German, and occasionally I make jokes. I don’t feel suicidal or trapped, just indefinitely ‘on hold’, although there have been times when the pain was so intense that I would have welcomed oblivion. I have asked my GP about ‘happy pills’ but I think the best treatment for my head will be to get to a state where I can do things. Posts and tweets from colleagues at the Centre for Social Informatics make me realise how much I value having been part of it, and how much I want to contribute to the work done there. The human side of computing, understanding how we can best use our technology, is where I want to be professionally, and I want to be doing it with the fine people at CSI. 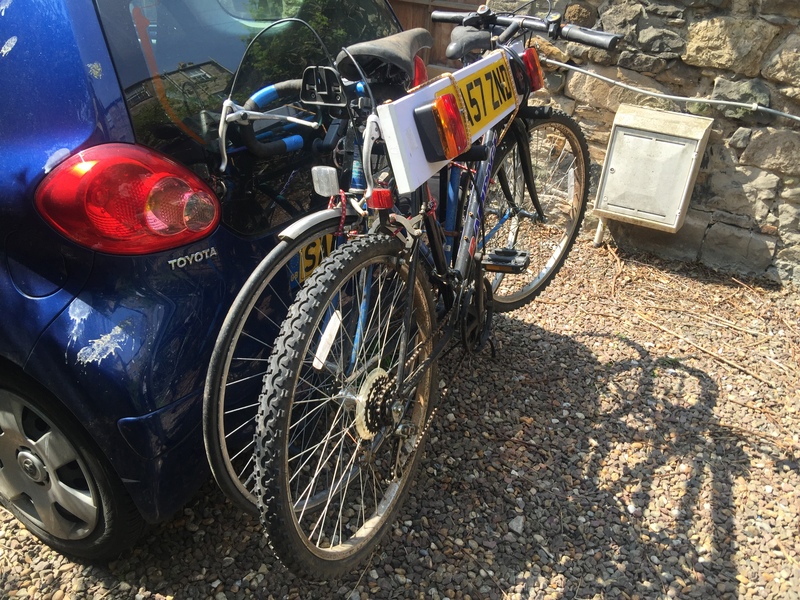 As part of the grand clear-out I’ve finally said goodbye to Vilior, the touring bike I bought while an undergraduate. Despite being second-hand, he lasted through lots of abuse, commuting and load-carrying until his top tube snapped about 3 years ago. Since then he’s lived in the cellar, waiting for me to make time to convert his parts into a bike trailer. An unsuccessful experiment with a cheap ready-made trailer ended that idea, so this morning Elly took our collection of bike-junk to the Bike Station. From now on, I’ll be riding Lev Davidovitch, Vilior’s 2012 ‘descendant’. 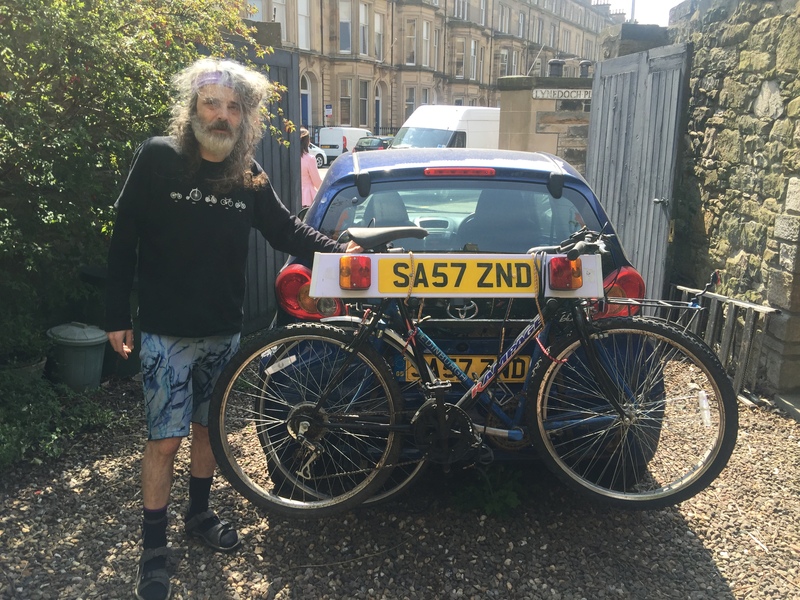 (They’re both from the Edinburgh Bicycle Co-op.) I’ll almost certainly stick with front and rear panniers for load-carrying, not least to limit the volume, but this trailer design might just sway me.